"CSS purports to separate style and content, but in fact it radically fails to do so. Rather, the opposite is true - CSS actually conflates style and structure. CSS stylesheets impose many implicit restrictions on the HTML structure. These restrictions are poorly defined and underspecified. […] Rules have a tendency to get tangled together, and its hard to pull them apart. Often, its faster to start from scratch than to modify an existing stylesheet. […] To conclude, I believe CSS is too complex, has no good WYSIWIG experience, and misses basic features found in other styling systems. CSS would be stronger if it only offered named styles, based-on styles, no cascade, and support for modules/namespacing. " "An API is a logical next step for newspapers. It will give developers access to their vast amounts of well-researched data, and allows the paper's brand to be spread easily across the web. More access to Times content and the ability to mash it up in new and interesting ways can only be a win for both readers and the paper. […] Says Aron Pilhofer, the paper's interactive news editor, the goal of an API is to "make the NYT programmable. Everything we produce should be organized data."" Using Munin you can easily monitor the performance of your computers, networks, SANs, applications, weather measurements and whatever comes to mind. It makes it easy to determine "what's different today" when a performance problem crops up. It makes it easy to see how you're doing capacity-wise on any resources." "Branching and merging in Subversion are painful. If you’ve never used it, you don’t know what I mean. If you have, you do. Branching and merging in git, though, are wonderfully, blissfully straightforward. For those two reasons alone git is worth the switch for us, though there are lots of other, more advanced, features we like about git, too (git-stash, git-bisect, etc.)" "As the media theorist Marshall McLuhan pointed out in the 1960s, media are not just passive channels of information. They supply the stuff of thought, but they also shape the process of thought. And what the Net seems to be doing is chipping away my capacity for concentration and contemplation. My mind now expects to take in information the way the Net distributes it: in a swiftly moving stream of particles. Once I was a scuba diver in the sea of words. Now I zip along the surface like a guy on a Jet Ski. I’m not the only one. When I mention my troubles with reading to friends and acquaintances—literary types, most of them—many say they’re having similar experiences. The more they use the Web, the more they have to fight to stay focused on long pieces of writing." "Probably the most striking revelation about the semantic search space is User Interface. First, to go on the tangent, Powerset got it right by realizing that semantics needs to be surfaced in the UI. After a user searches Powerset, a contextual gadget, aware of the semantics of the results, helps the user complete the search experience." "The role of editor as arbiter and gate keeper is increasingly becoming automated because the taxonomy systems are becoming too complex for any one person to keep abreast of. However, this is also important because taxonomy is the new navigation, something which I believe Drupal does inordinately well. 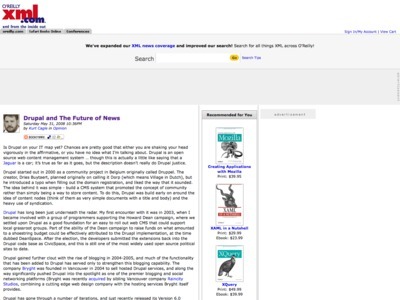 Most news sites have transcended the level where a human being can reasonably serve to build navigation, search engines face a problem of geometric expansion of content in the long term, and thus its likely that taxonomic navigation will be the dominant face of finding news moving forward. Watch the space of stochastic taxonomic analyzers; I suspect it will be a significant growth industry in the comparatively near term. The irony of course is that in building the initial web, the metaphor most commonly used was that of the magazine, but as with any new technology, the metaphors that drove the initial adoption eventually fade away as the capabilities of the new technology shape the parameters of what can be done in that medium. Whether the existing news providers will in fact survive that transition remains to be seen."